Before I began my fitness journey, I felt as though I was trapped in a stranger’s body. I would look in the mirror and not recognize the person looking back at me, and I did not feel comfortable in my skin. I even started to become uncomfortable wearing a bikini -- even in front of my family. This was strange; during my childhood I lived in my bathing suit and never thought twice about how I looked in one. Last summer I looked at a specific unflattering photo of myself and I knew I had to make a change. Alongside a healthy diet, I knew that working out played a vital role in my weight loss. I started working out at California Family Fitness to get out of the house and into an environment that would inspire me to have productive workouts. Cal Fit has a wide variety of equipment and amenities and I can switch up my workouts with rock climbing, weight lifting, cardio, and swimming to keep my workouts fun. 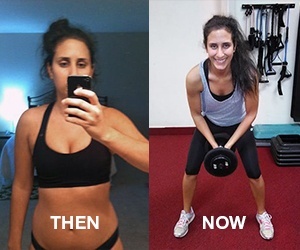 To meet my fitness goals, I knew I couldn’t do it on my own. I knew what changes I needed to make, but when it came to making those changes, I couldn’t do it myself. I felt as though there was some sort of mental road block that prevented me from going to the gym. That is why I decided to do personal training with Bruce at the Rocklin club. Making a weekly commitment held me accountable—if I didn’t keep up with the workouts on my own, I would end up paying for it the following week. Bruce is the best trainer I could have hoped for. During our first session, I was nervous and quite terrible at everything he had me do, but he still made me feel at ease. During my transformation there were times I did not feel motivated to go to the gym, but Bruce would text me words of encouragement to help get me back on track. Even though I met my initial goal of getting back to my normal weight, I haven’t stopped there. I have continued to work with Bruce and he always encourages me to strive for more. I’m stronger and more confident than I ever have been, I’m more comfortable trying new activities, and I feel like a better version of myself.